Click on photo to view more of each station! BLOG: Read your webmaster's impressions of L9 Sud (Feb 2016) here! 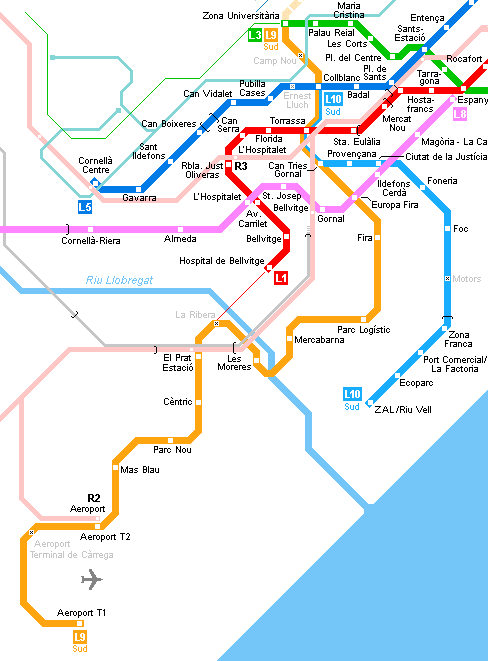 Eventually Line 9/10 will run like a semicircular line from the Airport and Passeig de la Zona Franca to Zona Universitària, further on to Sarrià and Lesseps and via Guinardó and Sagrera-Meridiana to the planned Sagrera AVE Railway Station. Then north to Bon Pastor and under the Besòs river splitting into two branches, one to Santa Coloma (Can Zam) and one to Badalona (Gorg - L2). Construction from Sagrera-Meridiana (L1, L5) north to Can Zam and Gorg began in late 2001. L9/10 is being excavated by tunnel boring machines at great depth, with a 12 m diameter tunnel, which allows trains to run on top of each other. Most stations will be located inside this tunnel and be accessible by lifts. 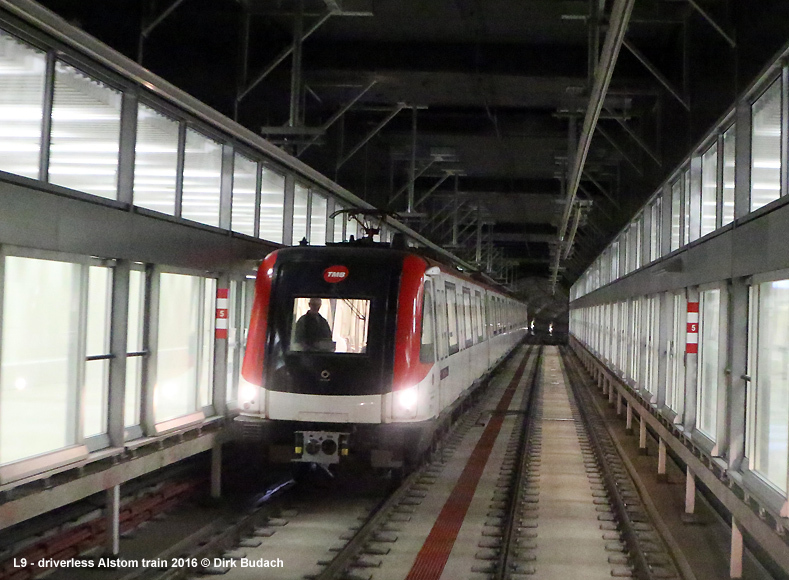 The line is operated in driverless mode and the stations are therefore equipped with platform screen doors. Part of the Zona Franca leg in the south will be elevated. The project has repeatedly been modified, especially in the airport area. The first section of this 46.6 km long line was due to open in 2005 from Fondo to Can Zam, but was only brought into service in Dec. 2009, with the second of the two northern branches following in 2010. The isolated L9 Sud began operation in Feb. 2016, followed by the first section of L10 Sud in Sept 2018.